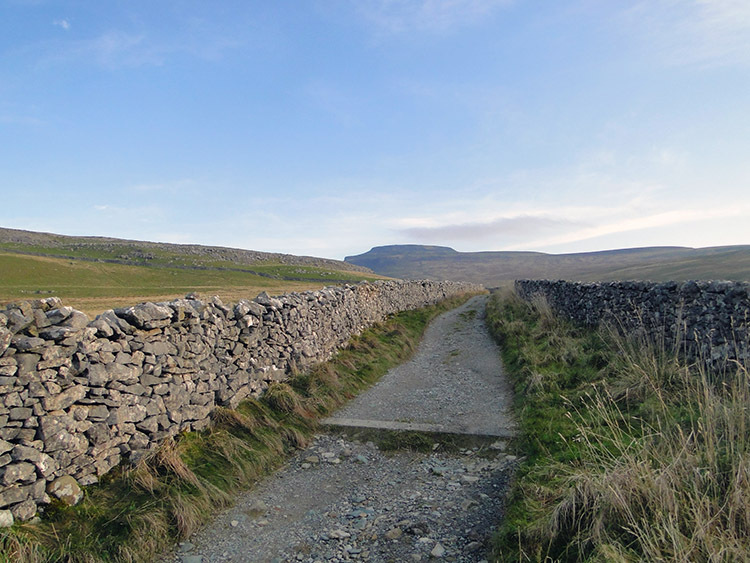 Summary: The classic route up to Ingleborough is from Ingleton along Fell Lane to Crina Bottom and then to the summit. 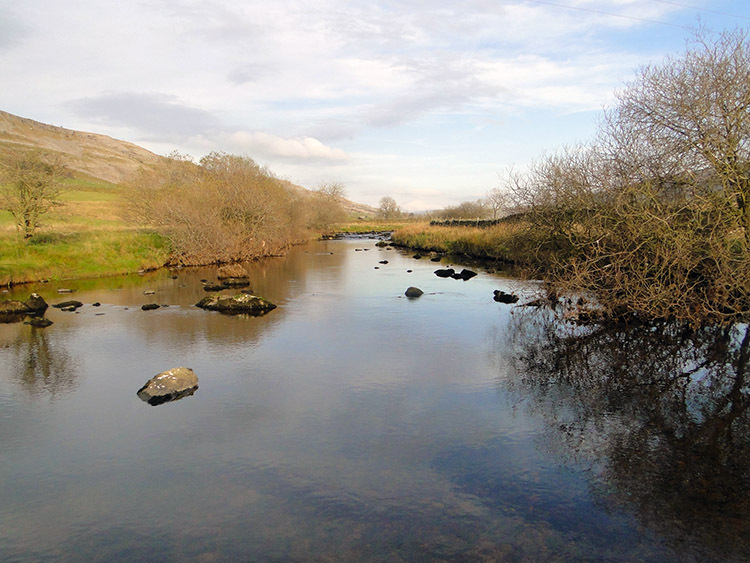 This walk follows the route while avoiding the bustle of Ingleton by starting from Skirwith. 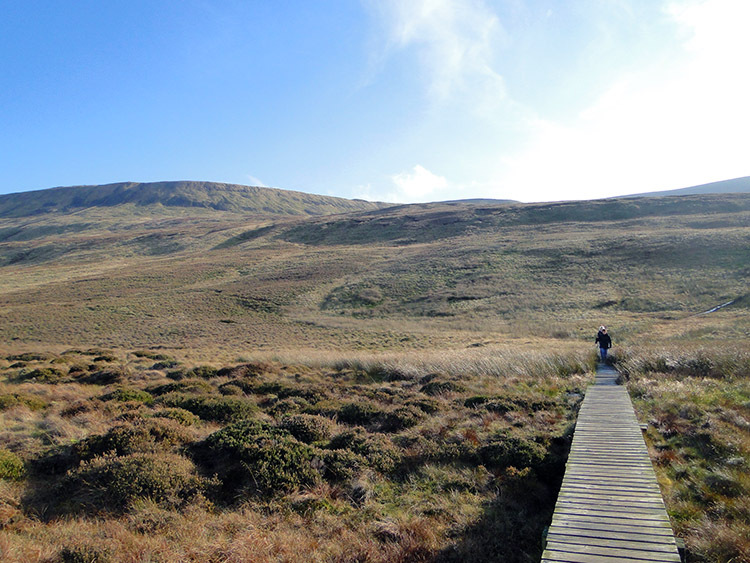 After reaching the summit the descent to Chapel-le-Dale is initially steep then eases on the boards and walkway across Humphrey Bottom. After Chapel-le-Dale the walk is straightforward along the roman road back to Beezleys before the stepping stones over the River Doe take us back to the start at Skirwith. The Walk: It is always good to walk in late Autumn before the dark grey days of winter set in and so I especially look for the opportunity to get outdoors for a good stretch of the legs on sunny days around October/ November time. It was the 19th November 2011, days were drawing in towards their minimum length, it was a weekend and it was a Saturday. All the pieces of the puzzle fitted and both Lil and Leena had been wanting to go for a walk for some time so I provided them with a beauty. They would walk just over half, I would walk it all - more on why when we get there. 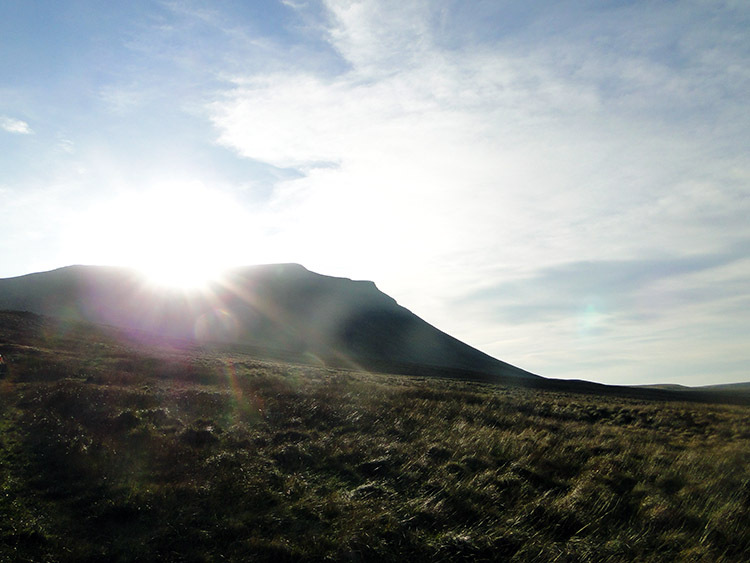 The objective of the walk was Ingleborough, probably Yorkshire's most recognisable mountain with its unique flat top. I have climbed the mountain many times, indeed there are walks to Ingleborough from different directions on this website, but this route was the very first I took to Ingleborough though on that occasion I set off from Ingleton. This time I avoided the village which masquerades as a town by driving a short distance on the B6255 to Skirwith where I parked the car and prepared with my walking colleagues for the walk. Both girls were happy it was sunny and clear as we set off under the glorious cloudless sky. Winter sunshine, with the air bereft of heat haze, provides the best of distance views and it was not long after we set off along the Fell Lane access track to the uplands that we cast our eyes forward to our first view of the objective mountain. 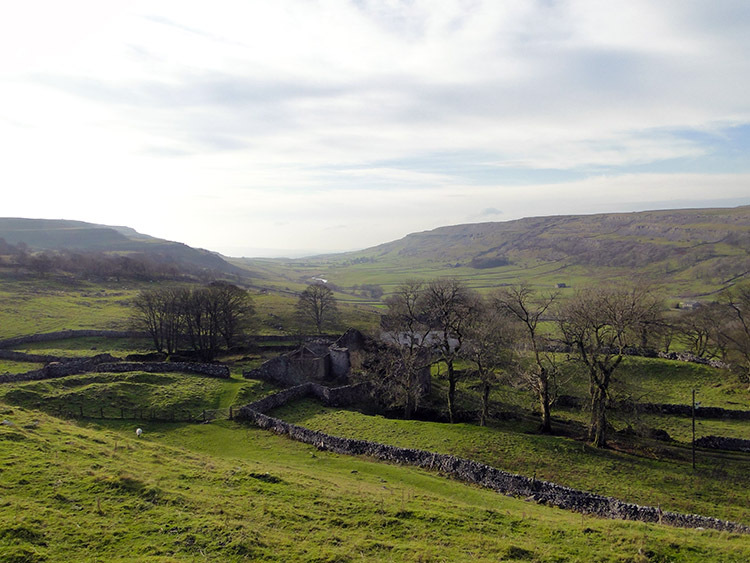 We climbed steadily along Fell Lane to Crina Bottom, a place where many photographs of Ingleborough's stunning south west facing profile can be best enjoyed. After passing Crina Bottom we continued to walk at a reasonable pace, both my companions performing admirably in their journey to the summit. Lil is not usually a fast walker but she was charged with energy this day and I was both pleased and amazed when the girls caught up with a mature gentleman on the final ascent to the top. It was not a race but I felt they both had an objective to get up Ingleborough as quickly as possible so they could then take a break and enjoy the descent. It just happened the solitary gentleman was on a much more relaxed mission. 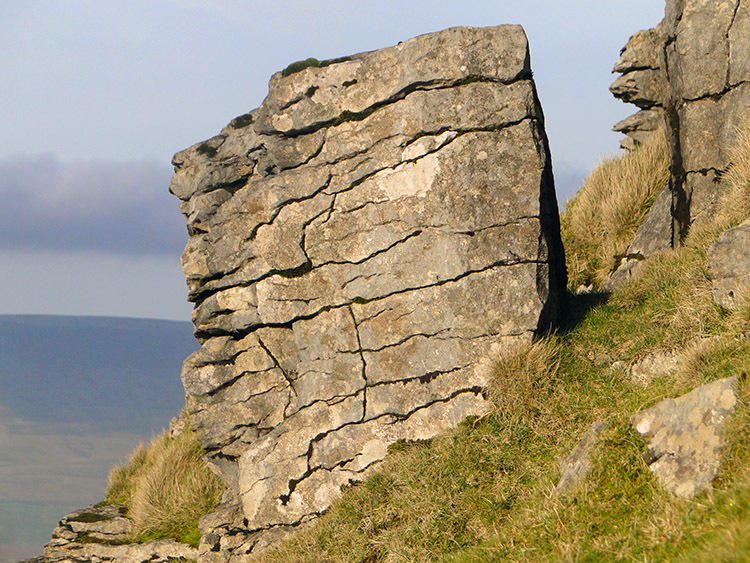 Ingleborough is not particularly known for rock outcrops and stacks but on the west facing face of the upper mountain at the place known as Limestone Load there are a number of appreciable and interesting rock shapes. However, the rocks of Limestone Load are not limestone. 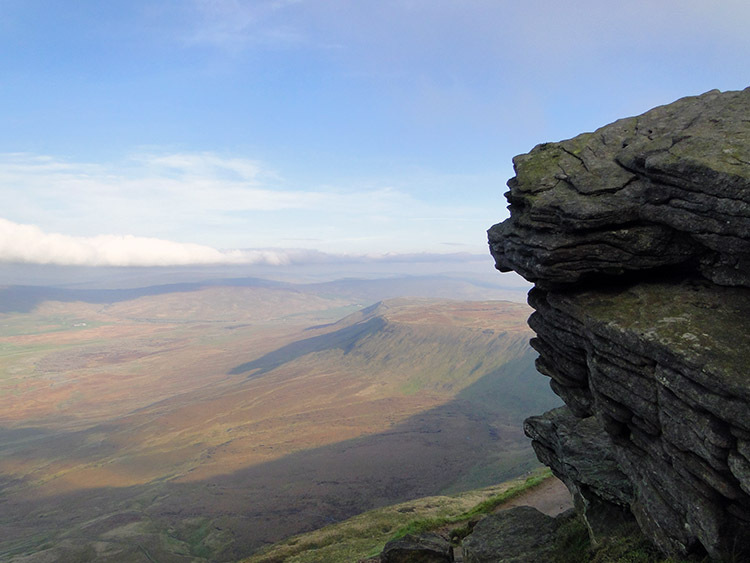 Ingleborough is protected from erosion by a cap of Millstone Grit approximately 30 metres thick and the rock sentinels, one resembling a frazzled face, were on this protective seam of gritstone. 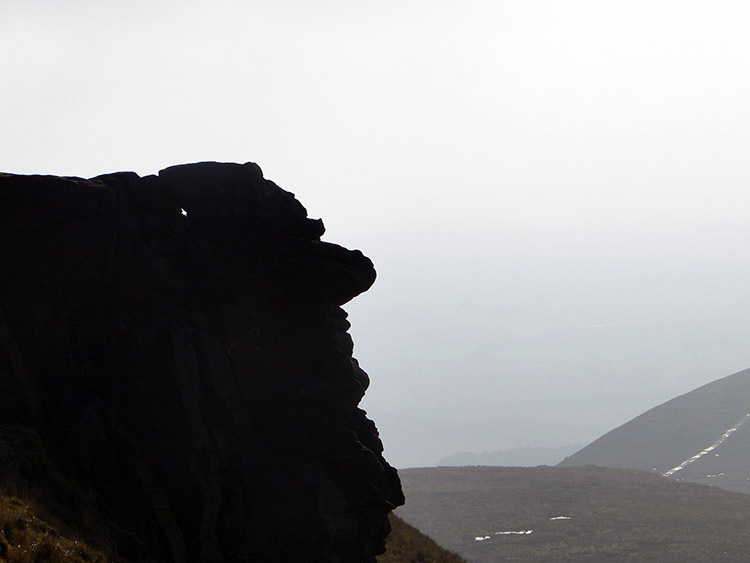 We should appreciate this top layer of hard rock as we walk up and over as it has been the protector of the mountain and helped retain its shape. After walking up the final rocky section of path to the summit plateau we crossed it to the trig point where the girls provided me with a beaming smile before we continued to the wind break shelter on the top of the mountain. 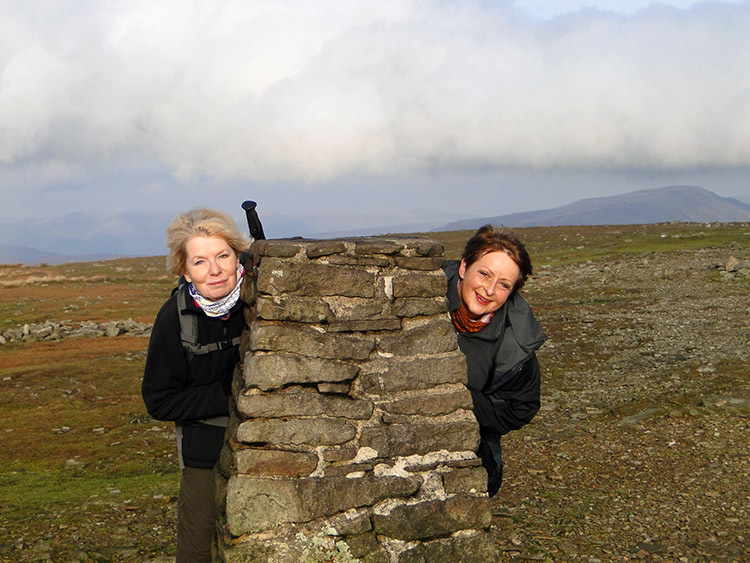 While Leena and Lil took a break and refreshment I explored the top plateau of Ingleborough. Along the northern and eastern edges of the plateau are the sporadic remains of a wall, remains of an Iron Age hill fort. I looked out over the wide magnificent panoramic view which is far-reaching and superb. 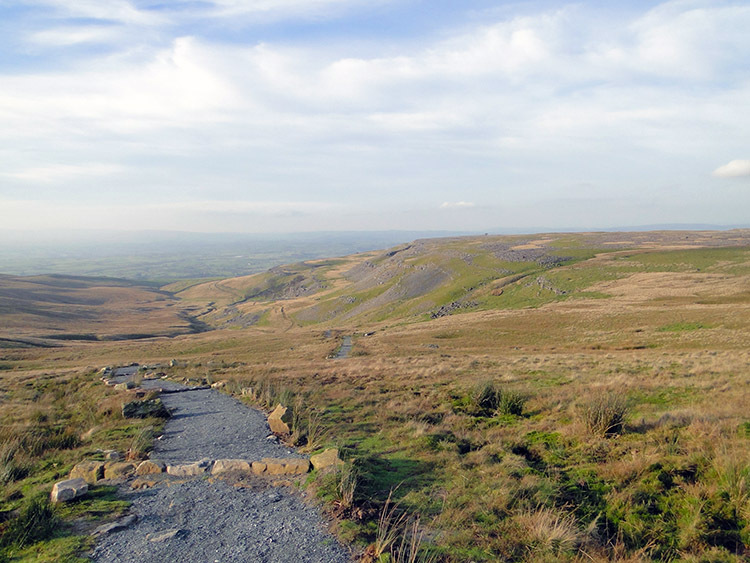 Most of the Yorkshire Dales mountains can be seen including Wild Boar Fell and Great Shunner Fell to the north and Pen-y-ghent and Great Whernside to the east. To the south more distant mountains can be seen including Carnedd Llewelyn 99 miles distant in Snowdonia and to the west the Lake District is visible with Old Man of Coniston, Scafell, Great Gable and Helvellyn all in the sight line. 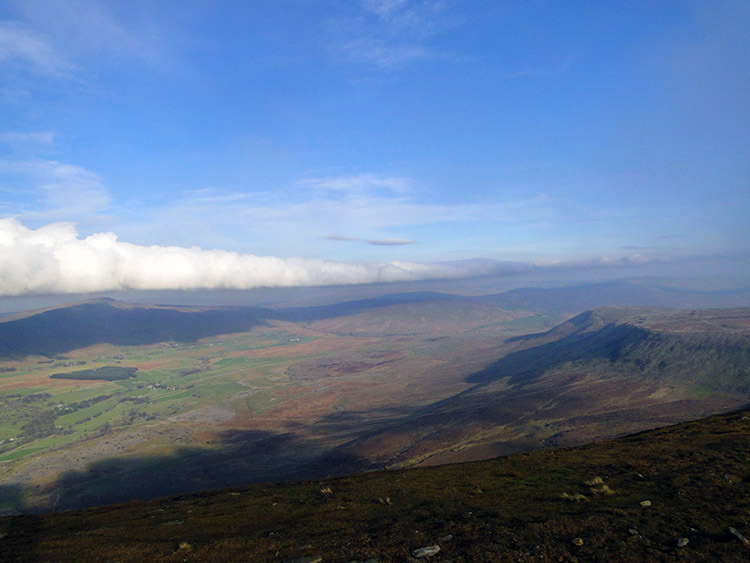 Being on Ingleborough on a day with perfect visibility can be as good as it gets. Alas for me nearer mountains were in sight but distant low cloud made the Snowdonia and Lake District distinctions a blur. Despite not getting to identify the far mountains the view from Ingleborough down into the near environment of the Dales was ample compensation. Ribblehead Viaduct could be seen as a tiny Meccano structure below with Whernside presenting a shifting light band dark image to the left of the viaduct. 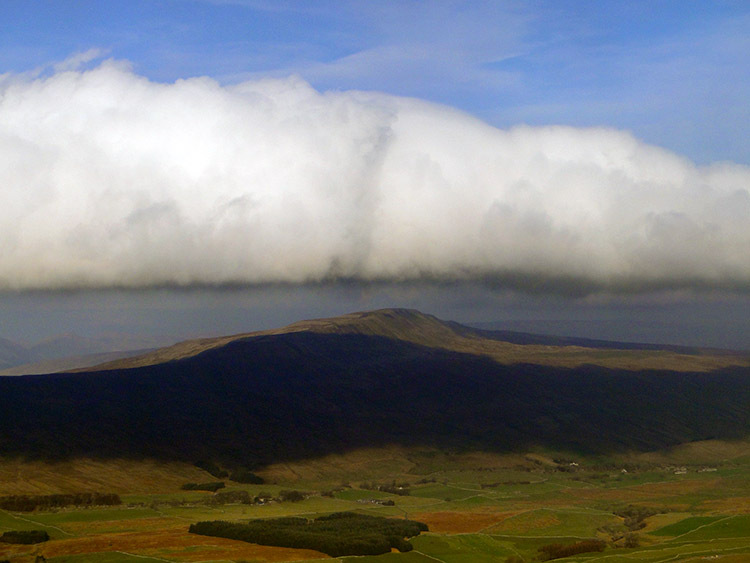 An inversion cloud hung almost motionless over Yorkshire's highest point, it not being completely still as the shifting shapes of the shadow cast revealed. It was a magical sight watching the slow moving change while the cloud never gave up its fixed grip. Lil imagined it to the cloud sweeping over New York in the Tom Cruise remake of War of the World's. I too could imagine her vision, something eerie sweeping out of the strange cloud. From science fiction to natural fact. 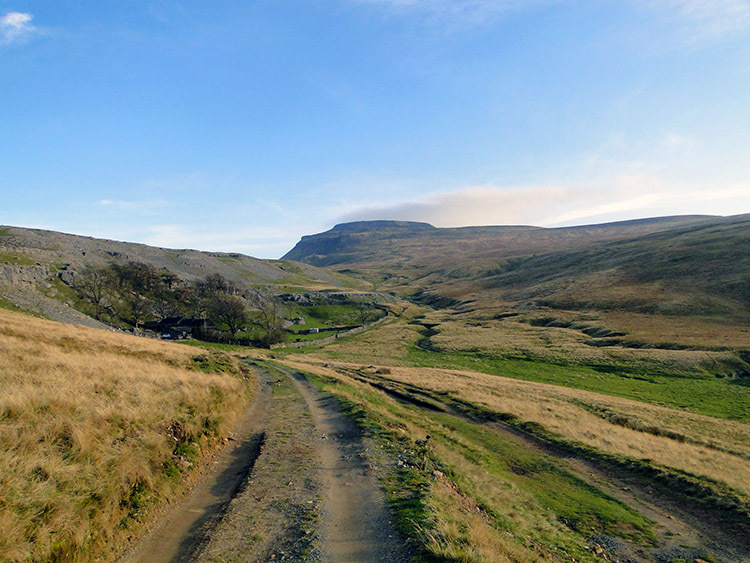 We had to make the hardest of all descents from Ingleborough to Humphrey Bottom, the north face presenting a steep switchback path with 100 metres descent in less than 200 metres of distance. Three Peak walkers face it as the hardest piece of uphill during the entire 26 mile walk. Believe me it is even harder going down it safely and while I managed it fairly comfortably both Leena and Lil struggled to get down the steepest parts of the face, often clambering on their backsides. I realised it was difficult for them and waited patiently close by, offering help which they declined. 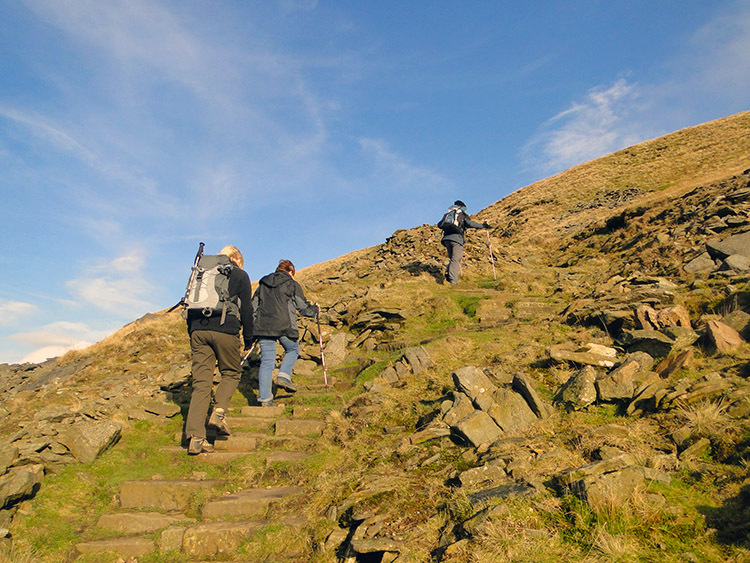 Steep descents are often best done by yourself and with the most attentive caution. With the necessary care they both got safely down to Humphrey Bottom and when they did I could see the palpable relief etched on their faces. At least now they could relax somewhat and bound over the duck boards that cross the sodden ground of Humphrey Bottom. From Humphrey Bottom we continued beyond the peaty morass to firmer ground and soon came to the vast hole of Braithwaite Wife Hole, a huge funnel shaped sink hole where I have seen potholers exploring in the past. There must be access to caves below the ground at Braithwaite Wife Hole. 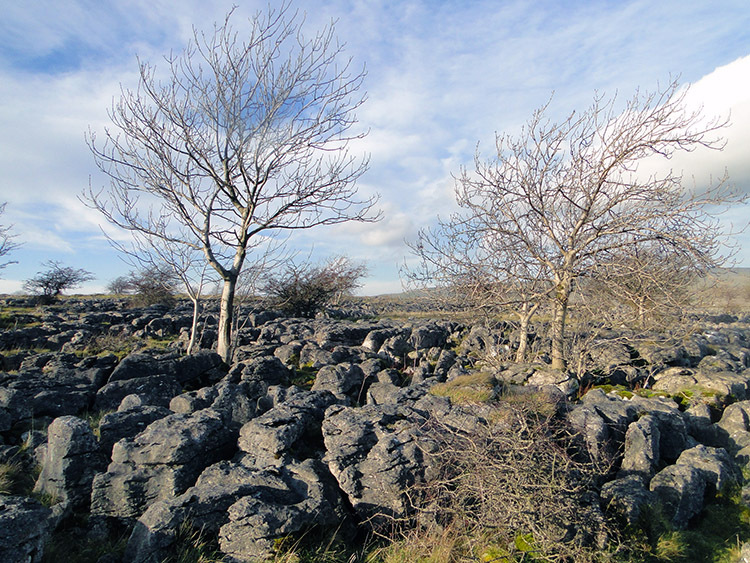 I much prefer the above ground spectacle of such areas, sink holes often form in limestone and true enough, near Braithwaite Hole are the superb outcrops and pavements of Southerscales Scars. I love this place so was very happy to be back. I explored the nooks and crannies of Southerscales Scars just away from the path while Lil and Leena ambled along. 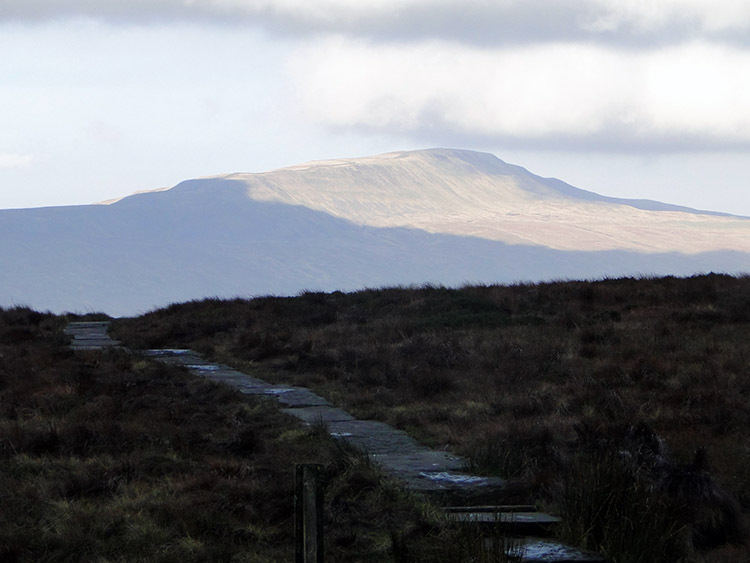 On speaking with them I could see the efforts of the Ingleborough descent had tired them. So I made a suggestion. "If the Hill Inn is open why don't you two stay for a drink and a bite to eat in the warm while I power walk back to the car". "How long will you be" Lil asked. "Ninety minutes which will be three hours if you two continue to the finish with me" was my response. "OK, it makes sense and we are tiring now" Lil added. 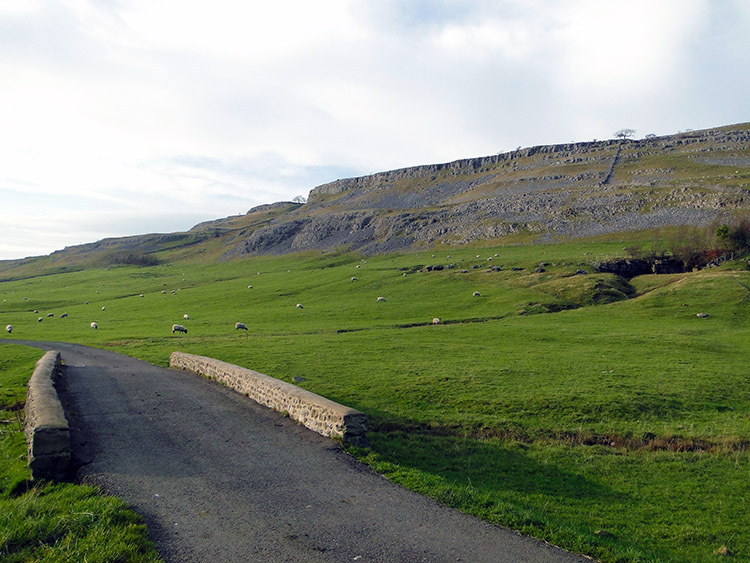 They were both in agreement with my plan so we made our way down across the scenic fields of Upper Ribblesdale to the pub which was indeed open. Lil and Leena steeped into the pub, I stepped on towards Chapel-le-Dale. Once pat the small church and through the tiny silent village I briskly strode out along the roman road which ran parallel to Twisleton Scars. I remembered this stretch of road from my earliest memories of walking in the area with Steve in the early 1990's. 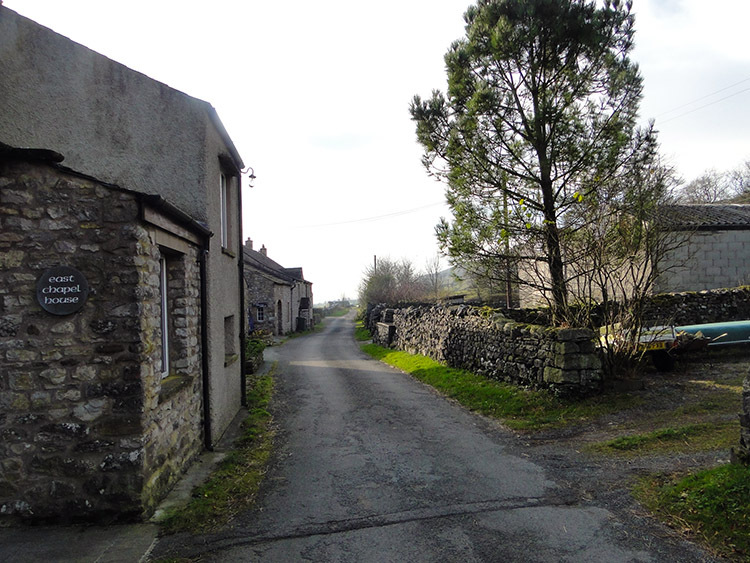 As I continued on my good pace along the flat straight road I recalled two occasions past, one on the return stretch of a Whernside ascent walk from Ingleton and the other being that first ascent of Ingleborough from Ingleton; indeed this exact route bar the avoidance of the final road section into the village. 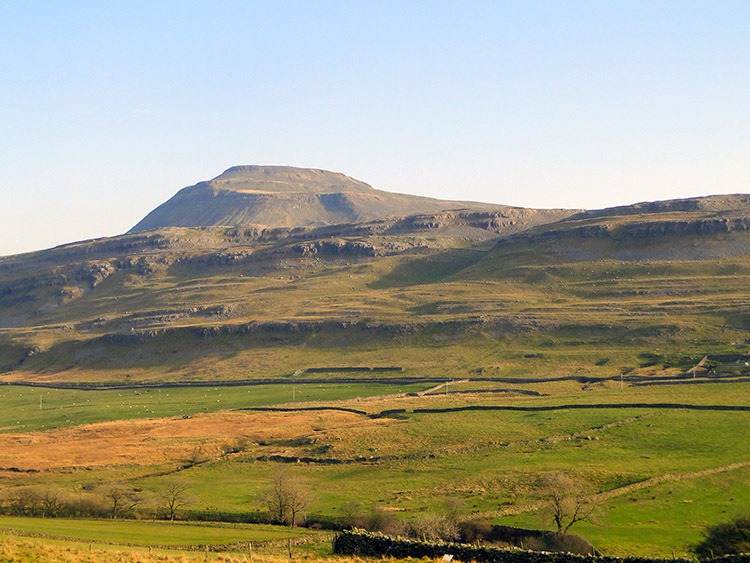 As I strode out past Springcote and Twisleton Dale House I looked over my shoulder back to Ingleborough, its upland bulk standing high over Raven Crag and still as impressive as from the south west, this time from the north west viewpoint. 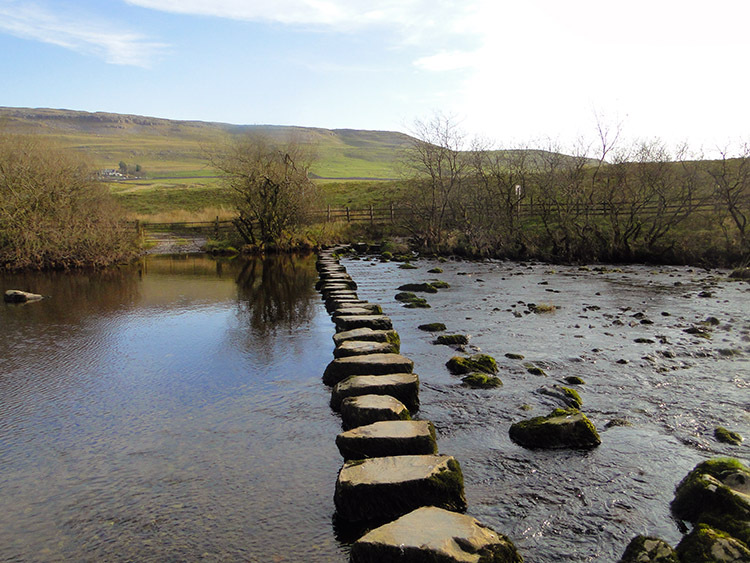 My fleet journey on the roman road came to a conclusion at Beezleys when I turned off Oddie's Lane which would have led me into Ingleton and instead took a course south east down to cross the River Doe at some impressive sturdy stepping stones. After crossing the river I headed to Skirwith Quarry which I rounded to the south east and then walked through a small pretty copse back to the car. Deed done, what a brilliant walk it was, a good old favourite revisited. My final act, after changing, was to recover Leena and Lil from the pub. They had enjoyed their time in the pub and on conversation while driving home it was clear they had really enjoyed their part of the walk too. They particularly mentioned the mutual company we all enjoyed as special and they did both enjoy the special views down to Ribblehead from Ingleborough.